Take a look around the gallery for some of the best home made graduation invitations for college. Get hints and tips from readers like yourself to create a simple design to suit your personality. 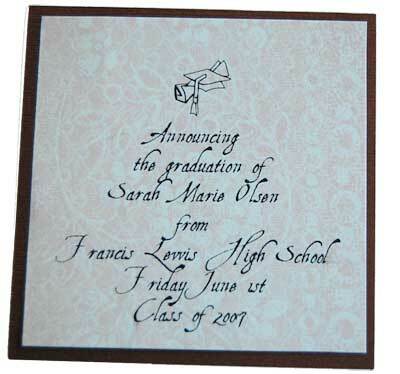 Make a simple and elegant Graduation Invitation with clipart and a great font. I used brown cardstock to make the backing of these invites. The nice chocolaty color is great and adds a bit of strength to the main invitation (the picture I took makes the background look black) I printed the information on to patterned pink scrapbooking cardstock. Scrapbook papers come in size 12"x12" so I was able to print nine at a time onto 1 sheet. These invitations were made for the graduation ceremony. They were printed three at a time onto a4 cardstock and measure approximately8.25"x3.5". The text was aligned right justified and was typed with Jane Austin font which I downloaded for free off the internet. 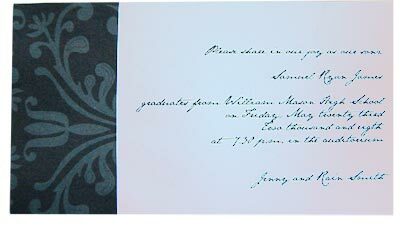 This is a nice classy font for formal invitations. The left side of the invitation was covered with black and white patterned paper with a floral pattern. Flourish and Damask patterns look great too. These were very quick and easy to make.